ADATA has started shipments of its new memory modules that feature hybrid air and liquid-based cooling systems along with RGB lighting. The new XPG Spectrix D80 DDR4 RGB modules use ADATA’s Jellyfish concept the company revealed earlier this year at CES, but in a less aggressive way than presented originally. ADATA’s concept submerged the memory chips in a non-conductive liquid, but the XPG Spectrix D80 liquid-cools only a part of the PCB. ADATA plans to offer XPG Spectrix D80 DDR4 RGB DIMMs rated for DDR4-2666 to DDR4-3600 initially, targeting both AMD Ryzen and Intel Core platforms. The value-add of these modules is the cooling system, which according to ADATA, along with 'an advanced PCB', promise to enable a rather high overclocking potential. Just like other high-end memory modules, ADATA’s XPG Spectrix D80 DIMMs rely on hand-picked memory chips as well as 10-layer PCBs featuring thermally conductive materials. Based on an image published by the manufacturer, the modules currently use DRAMs from SK Hynix. 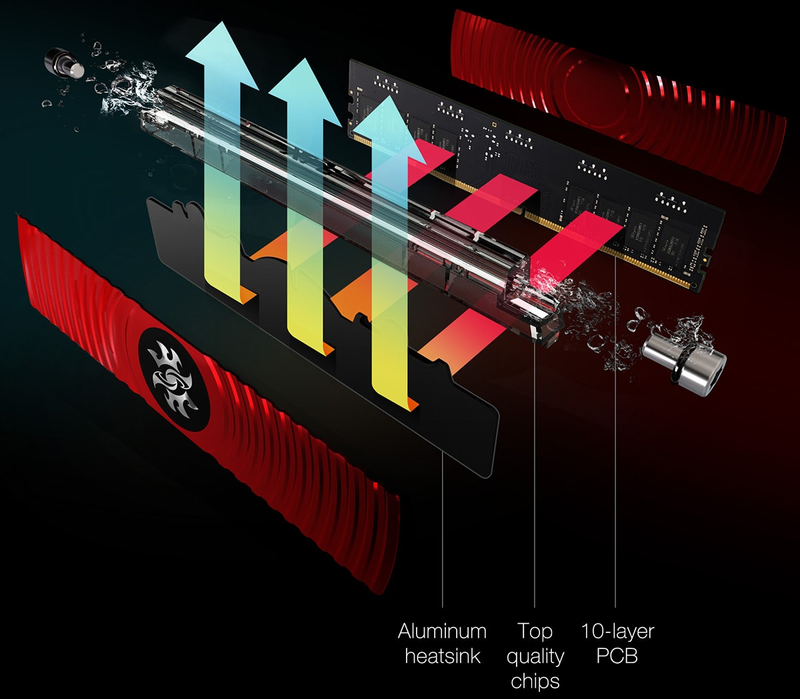 It is highly likely that ADATA takes a page from Corsair Dominator’s book and uses a special copper layer to transfer heat from DRAM ICs to the top of the PCB, but at this point the manufacturer does not confirm this officially. The key feature of the XPG Spectrix D80 modules is their cooling system that features aluminum heat spreaders attached to the memory chips as well as a top bar with a non-conductive liquid attached to the top of the PCB. The liquid in the top bar behaves the same way as heat (vapor) chambers and heat pipes: it changes state to gas (or at least changes its viscosity) when heated and turns back to liquid when cooled down. 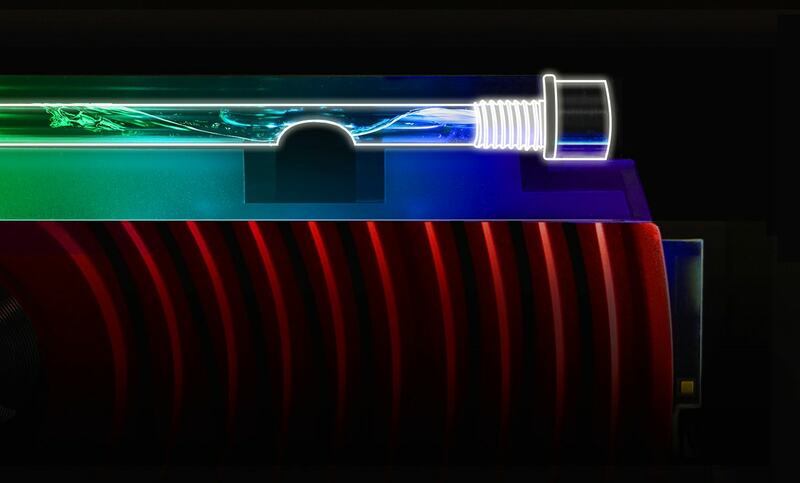 This phase change absorbs a lot of thermal energy and takes the heat away from its source: in this case the PCB conducting heat from memory chips. As an added bonus, when combined with RGB LEDs, the liquid in the top bars distorts the lighting effect, creating a more unique presentation - something that might please enthusiasts and modders. Speaking of the RGB lighting, it is necessary to note that the new modules ship with ADATA’s app that can synchronize their lighting with that of motherboards from ASUS, ASRock, GIGABYTE, and MSI. Meanwhile, since ADATA’s Jellyfish seems to be a work in progress, it is possible that eventually we will see different implementations of this concept. Moving on to actual specifications of the products. As noted, the initial XPG Spectrix D80 DDR4 RGB memory modules will use 8 Gb DRAM ICs from SK Hynix rated for DDR4-2666 to DDR4-3600 at 1.20-1.35 Volts, but subsequently higher-performing SKUs could use other memory chips from different vendors. ADATA plans to offer XPG Spectrix D80 memory in dual-channel and quad-channel kits based on 8 GB or 16 GB modules, targeting various grades of enthusiast class systems. All the new DIMMs will support Intel’s XMP 2.0 SPD profiles. 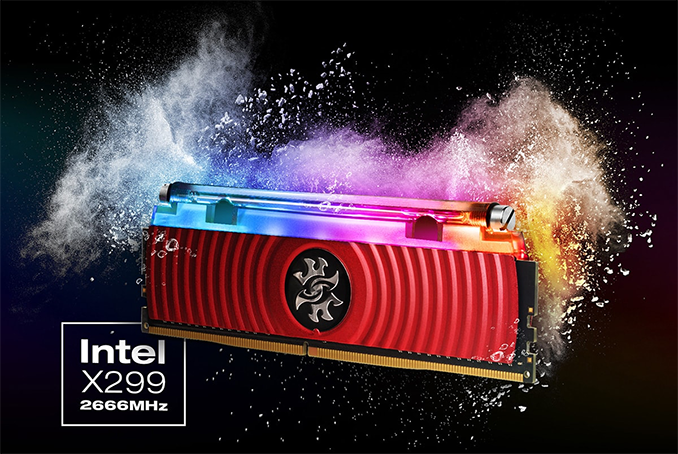 ADATA’s initial XPG Spectrix D80 DDR4 RGB products will be available in the coming weeks. A 16 GB dual-channel DDR4-2666 kit will cost $199.99, whereas a more advanced 32 GB quad-channel DDR4-3000 kit will retail for $419.99. Looks like total garbage. Been reading Anand since the early '00s, and finally had to register to comment. WHEN, MY GOD, WHEN will these manufacturers start making products that don't look like a 5 year-olds idea of what tech should look like??? Just gotta unload here... MSI with their stupid dragon on everything, gigabyte with their silly eagle and some sort of ancient egyptian angle, asus with their hamburgler guy plastered on everything... ENOUGH!